A Matt Blinkhorn double ensured that Fylde won their first Lancashire Senior Cup tie at the expense of a youthful Bolton Wanderers side. Coasters veteran Blinkhorn put the visitors ahead shortly before the interval at Lancashire FA headquarters in Leyland before Cole Lonsdale’s improvised finish drew the sides level. However, second-half strikes from Blinkhorn and Henry Jones put Fylde firmly in control and on their way to a clash with Oldham Athletic in the next round. 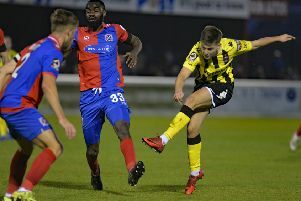 Coasters boss Dave Challinor shuffled his pack for the trip to the County Ground, making 11 changes to the side beaten at Aldershot Town at the weekend, with six youngsters from the Academy set-up included in the squad. The visitors made a bright start, with Serhat Tasdemir going close on the quarter-hour - Bolton stopper James Aspinall pushed the midfielder’s low drive from distance around the post. Fylde looked more likely to break the deadlock as the half wore on, though each side lacked a cutting edge. Referee Lewis Smith dished out three booking - two for the hosts and one for Fylde - in the opening half-hour. The deadlock was eventually broken on 37 minutes, when Simon Grand curled a cross in to the lurking Blinkhorn, who effortlessly nodded past Aspinall from 12 yards. The Trotters looked for an immediate response when Jeff King played in Lonsdale, who broke down the left but his fierce strike was blocked for a corner. Lewis Montrose aimed to double the Coasters’ advantage in spectacular fashion on the stroke of half-time, when he cleverly intercepted a Bolton looked to break and lashed a powerful volley wide of the mark from 25 yards. The second half kicked off in the same vein, with neither side dominating. Bolton’s Alex Perry went closest five minutes after the break with a curling effort that flew wide of the far post. King tried his luck with a similar effort moments later from the edge of the Fylde box but his powerful strike crashed against the advertising boards. Bolton were getting closer to drawing level and Dennis Politic tested Rhys Taylor for the first time, forcing the Welsh stopper into a top save with a free-kick that was arrowing towards the top corner. Liam Edwards poked one narrowly over the bar from a dangerous corner on the hour mark as Bolton began to impose themselves on the game. A deserved equaliser duly arrived on 67 minutes when a cross from the right was impressively flicked out of Taylor's grasp by Bolton forward Lonsdale. Fylde hotshot Tasdemir almost hit back with a sucker punch when he let fly from 20 yards but his precise strike was touched around the post by Aspinall. However, it was the visitors that took the initiative and put themselves back in front with just over 10 minutes to play. Jones was brought down in the middle of the park and his free-kick was headed across goal by Grand and tucked away by the unmarked Blinkhorn. Fylde sealed their passage to the next round in the final minutes when Tasdemir set up Henry Jones inside the area, allowing the Welsh starlet to smash the ball home from close range. Bolton: Aspinall, Brockbank, Muskat, Edwards, Mitchell, Jones-Griffiths, Politic, Perry, King, Earling, Lonsdale; not used: Morris, Connell, Fearnley, Brown, Moulden. AFC Fylde: Taylor, Richards, McCready, Grand, Mangan, Ezewele, Jones, Montrose, Tasdemir (Goshawk 88), Trialist (Kay 74), Blinkhorn; not used: Kelly, Lynch.